Welcome to Market Profile Series. In the last tutorial we seen Market Profile Open Type and Confidence and this tutorial we will be discussing about What is Spike & Spike Rules. In Market Profile terms spike is nothing but last minute rally or last minute sell off typically in last 30-45min. In technical terms it is defined as late price probe either on the upside(rally) or on the downside(sell off). By observing Spike action in market and the next days follow through price action one can determine whether the previous days spike action is false move to confuse the traders or it is going to create a sustainable trend towards the spike direction. If previous day was a spike on the rally and today’s open is above yesterdays spike high then possibly trend could continue in the upward direction. Previous days base of the spike(bottom of spike) becomes the support. 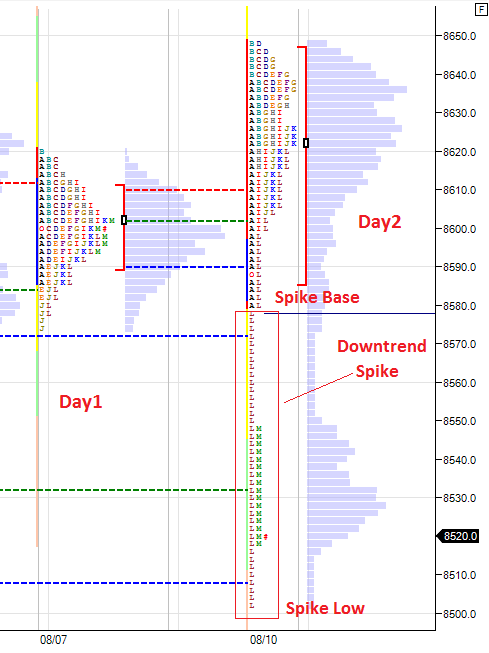 If previous day was a spike on the rally and today’s open is below yesterdays spike bottom then possibly trend could auction in the reverse direction. If previous day was a spike on the rally and today’s open is between the spike zone then probably price may be tried to follow two-way auction process and may try to find a new acceptance zone. If previous day was a spike on sell-off and today’s open is below yesterdays spike low then possibly trend could continue in the downward direction. Previous days base of the spike(top of spike) becomes the support. If previous day was a spike on sell-off and today’s open is above yesterdays spike top then possibly trend could auction in the reverse direction and could auction upwards. If previous day was a spike on sell-off and today’s open is between the spike zone then probably price may be tried to follow two-way auction process and may try to find a new acceptance zone. In the next tutorial, we will be discussing more in-depth about Failed Auction zones. great job Rajandran.Nice information on Market Profiles. Very useful knowledge rajendran sir. If your FA TOPIC PLEASE MAIL ME.